A team led by Rutgers University and including scientists from the U.S. Department of Energy’s (DOE) Brookhaven National Laboratory has demonstrated an x-ray imaging technique that could enable the development of smaller, faster, and more robust electronics. Described in a paper published on Nov. 27 in Nature Communications, the technique addresses a primary limitation in the emerging research field of “spintronics,” or spin electronics, using magnetic materials known as antiferromagnets (AFMs): the ability to image antiphase magnetic domains. Electrons in magnetic atoms point, or “spin,” in an up or down direction. In all magnetic materials, there are distinct regions—magnetic domains—in which the electron spins are arranged in a regular manner. Several configurations are possible depending on the type of magnetism. In AFMs, the spins on adjacent atoms point in opposite directions (e.g., up-down-up-down). While the spins within each domain are uniformly ordered, those within adjacent domains are aligned in a different way. For example, in AFMs, the spins in one domain may all be arranged in an up-down pattern, while down-up in a neighboring domain. Imaging these “antiphase” domains and the transitions (walls) that exist between them is the first step in being able to manipulate the magnetic state of AFMs to develop spintronic devices. Conventional electronics such as computer chips rely on the transport of electrical charge carriers, or electrons, to operate. As these charges move around, they dissipate energy in the form of heat, limiting device efficiency. Spintronics exploits another intrinsic property of electrons: spin. Because electron spins can be flipped from one magnetic polarity to another much faster than charge can be moved around, devices based on spintronics can be intrinsically faster than today’s electronics. To date, most spintronic devices have been based on ferromagnets (FMs)—the type of magnets we are most familiar with, as seen on fridges and in computer hard drives. In response to an external magnetic field, the domains in FMs align in a parallel fashion according to the direction of the field. However, AFMs offer several advantages over FMs. For example, because the spins in AFMs cancel out, these materials have no large-scale magnetism. Thus, their spin orientation can be flipped even faster, and they do not generate stray magnetic fields that can interfere with other sources of magnetization. In addition, they are much more resilient to external magnetic fields. But the same characteristics that make AFMs appealing for spintronics also make these materials difficult to control. “In order to control them, we first need to answer very basic questions, such as how the domains are arranged in space and how they and their walls move in response to external perturbations like temperature changes, electric fields, and light pulses,” said Mazzoli. In this study, the scientists directed a coherent beam of x-rays from the CSX beamline through a circular pinhole to illuminate the magnetic order of an iron-based AFM sample synthesized by members of Rutgers’ Department of Physics and Astronomy, including Kiryukhin and first author and postdoctoral associate Min Gyu Kim. They set the beamline x-rays to an energy resonating with (close to) the energy of the spins in the material. A detector captured the intensity of the light as it reflected off the sample. Though this magnetic diffraction technique is well known, this study represents the first time it has been successfully applied to antiphase domain imaging in AFMs. In fractions of a second, a full picture of extended areas (hundreds of microns by hundreds of microns) of the sample is generated, without having to move any instrumentation. In other magnetic imaging techniques, a probe must be scanned over the surface at multiple points, or calculations are required to project the resulting detector patterns onto real-space images that our eyes can understand. The speed of the technique makes it ideally suited for dynamic experiments. Here, the scientists studied how the magnetic domains changed in real time as they heated the sample to “melt” (remove) its antiferromagnetic order and cooled it to bring back the order in the form of the domain arrangement. They discovered that some of the domains were free to move with each thermal cycle, while others were not. Going forward, the team plans to test the technique using other AFMs and different classes of materials. 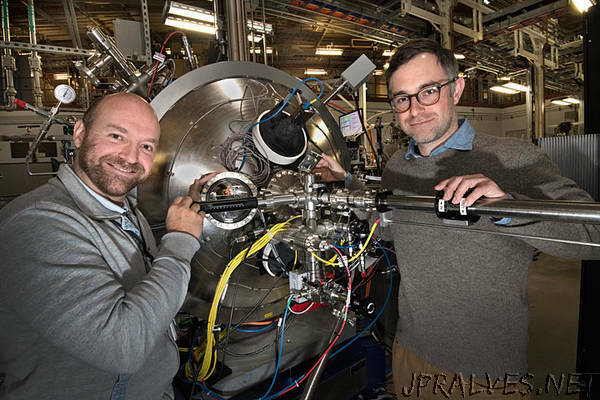 The team also plans to improve the current resolution of the technique to below 100 nanometers by reconfiguring the experimental setup. This improved resolution would enable them to determine domain wall thickness. The other Brookhaven co-authors are Hu Miao of the CMPMS Department and Andi Barbour, Wen Hu, and Stuart Wilkins of NSLS-II.